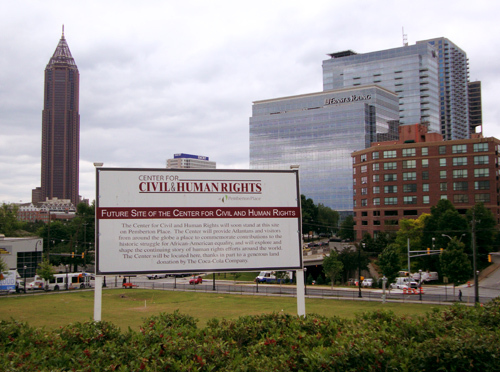 "This Center will explore the universal search for a secure human existence, in a way that inspires vigilance and leadership among future generations," tops the homepage announcing the future Center for Civil & Human Rights. The Center for Civil & Human Rights will be located in the northeast corner of Pemberton Place, also home of Georgia Aquarium and the World of Coca-Cola, adjacent to Centennial Olympic Park. At the corner of Ivan Allen, Jr. Boulevard and Centennial Olympic Park Drive, visitors to the Center will enjoy easy access from downtown Atlanta and will also be near many other attractions. The new Center promises to be a distinctive structure architecturally with stupendous vistas, an internal plaza suitable for meditation and reflection, and a design that provokes a vision of unity.